There’s probably no one more well-known in the bodybuilding world than the governor of California. Arnold Schwarzenegger made bodybuilding afamily phenomenon with the release of his 1973 movie “Pumping Iron”. He has been granted the honour of single handedly making bodybuilding an everyday term.When Arnold first started out in his bodybuilding profession, he was just a young man. He started out as a “98 pound weakling” and grew into Mr.Universe. His transformation was an incredible display of bodybuilding might along with some amazing dedication.There is probably no better bodybuilding story than that of Arnold. He worked a variety of jobs including that of street worker in Santa Monica, California. The entire time, he was also devoting all his off hours to honing and sculpting a beautiful body. In 1970, he was awarded the ultimate bodybuilding title of “Mr. Universe” and became a family name.He kept on with his bodybuilding until he decided that a film career was the way to go. He found success as an actor in such films as “The Terminator”, “End of Days”, and “True Lies”. While he never won any type of prizefor his acting work, he still garnered the respect of many Hollywood elite for his strong performances in these films. 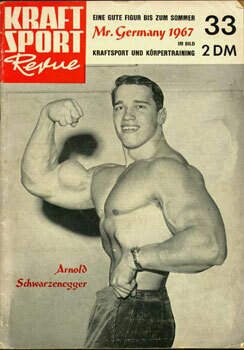 Arnold's first approach to bodybuilding was fairly atypical. When he was 13, he played soccer, but felt very dissatisfied with a team sport. "I didn't like the fact that I couldn't be personally gratified" he declared. He tried other endeavors: track and field, boxing, javelin and weightlifting. But only when his coach suggested he tried working with weights (to strengthen his legs), Arnold found his true vocation. When he first strolled into a gym he was literally awed. "I found myself in a gym, in awe of guys with muscles I had never seen beforehand, muscles I didn't even know the names of. The bodybuilders were dominant and powerful looking, almost Herculean. Before my very eyes, the possibilities of what I could achieve opened up before me: I had found the answer I had been looking for." Thus began, at 16, the career of the greatest bodybuilder of all times, the man who would be crowned Mr. Olympia for a record seven times. As Arnolds massive muscled physique began developing, so did his self confidence. Very soon he discovered something once described as the "power of size". And, as his muscles grew, so did the respect he received from his peers. The size of his muscular mass, began to influence his interactions with other young men and, of course, with the ladies too. He realized that some women were decidedly turned on by his physique, whereas others appearedto be disgusted by it. "I wanted to become even larger, so that I'd be able to really impress the girls who liked muscles and... annoy the ones who disliked them." Arnold Schwarzenegger is probably the best known figure when anyone mentions bodybuilding. When you are serious about your bodybuilding goals, you could do a lot worse than following the advice of the governor of California! This entry was posted in Famous Bodybuilders and tagged arnold schwarzenegger, The Governor of California. Bookmark the permalink.